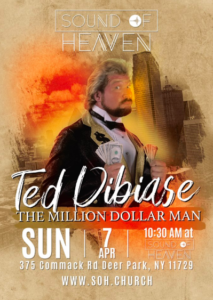 Join us as we welcome Ted DiBiase known as “The Million Dollar Man” of the 80s and 90s WWF to Sound of Heaven as he ministers the gospel. Throughout the 2000s, he would make special appearances with the WWE re-establishing his “Million Dollar Man” character. He then was hired as a producer with the company and had gone on to be inducted into the WWE Hall of fame. He continues to make cameo appearances on WWE programs like RAW and Smackdown. Since the mid 90s, Ted has been ministering at churches, youth events, couple seminars and even Sunday mornings at certain Comic Con events. He was the #1 most requested speaker for Promise Keepers International, is the author of 2 books, and was the subject of a documentary in 2017 entitled “The Price of Fame.” Invite a friend and come hear his story!